The amount of electrons wasted communicating that “Generational changes are going to change your contact center!” are enough to fuel a large fleet of Tesla vehicles for mileage equal to a trip to Mars and back. I had to re-write the opening of this because I sounded like a grumpy old man. You know the type, “Get off my lawn you darned kids!” Except I live in Arizona and there are no lawns. Well, there are those AstroTurf lawns that Snowbirds have in Sun City. If there are kids running all over them, then it serves the little buggers right to slip, fall and hurt themselves on that plastic. Toughens them up for the NFL. 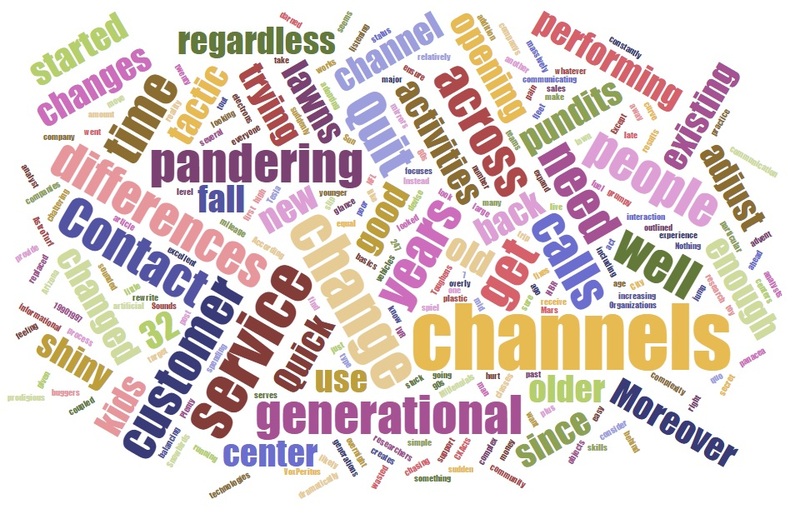 Over the past several years, the contact center technology spiel overly focuses on generational differences. According to the pandering pundits, those of us older than 32 years old just do not get it, the Millennials and younger suddenly changed their activities from everyone older than 32. Sounds good at first glance, but the more researchers have looked into this, the more they find few differences between generations. NICE’s Global Customer Experience survey provides a strong counter argument to the “everything’s changing” crowd. Nuance’s recent research provides a clear view that there are little to no differences between generations’ customer service expectations. Organizations should quit spending time trying to devise artificial generational differences while looking for quick fixes. Instead, they need to get back to basics and ensure that they are performing at a high level across people, process and technology, including existing interaction channels. Before opening up new channels, make sure that you are performing well in your existing channels. Moreover, quit listening to the chattering classes who are not on target about the need to expand support across an increasing number of channels. CXAct’s research outlined in this HBR article mirrors VoxPeritus’ experience; too many channels creates poor service across all channels. Moreover, customers are not stuck on a particular channel, regardless of their age; they want results regardless of channel. Since self-service started in the late 80’s with the advent of IVR, then took another major jump ahead in the mid 90’s with companies and their customers adopting the Internet, the complexity of calls increased dramatically. Quick, easy informational calls went away, but additional complex calls replaced them. This started twenty plus years ago! Nothing has massively changed since then. So consider the changes customer service teams had to adjust to from 1990-1997, during that time of increased self-service and additional communication channels. If your company did not adjust then, you are well behind the curve and likely are feeling the pain, as are your customers. Even if your organization always had great hires, the huge uptake in self-service eliminated the safety net of easy calls that could be “peeled out” for new hires. This change required raising the bar for new hires, simply because new CSRs coming out of training had to manage interactions that are more complex. For most contact centers, prior to 1995, writing skills were never a high priority as nearly every contact center communication with customers was over the phone. Post 1995, many organizations were communicating with customers via email through their websites, and the requirement increased for a good portion of the new hires to have good reading and writing skills. Previously, most customers voiced their complaints over the phone. Organizations who had a very tight complaint handling process in place now had to adjust their process to include an additional channel that was asynchronous, and fraught with misunderstandings created by the written word, rather than the better understanding of emotions via synchronous voice. Email was the predecessor to Facebook messages and Tweets. Yet, very few organizations get it right even twenty years later. Unless you are doing an excellent job today with email, why would you think that your organization can provide adequate service levels with their social media equivalents of Facebook and Twitter? Now your failure to provide good service and swiftly provide service recovery is front and center for the entire world to see. Per the HBR article referenced above, instead of allocating time and resources on attempting to provide service through even more channels, focus instead on your business basics and what causes customers to rant about your service on social media in the first place. If you improve your service via existing channels, including providing the means for customers to escalate service complaints through existing channels, you might surprise your Marketing team with a swift reduction of complaints in the digital public commons. If and only if, you can provide good to excellent service in your existing channels, should you consider adding new channels. Customers want to self-serve. Constantly analyze every facet of your digital and voice self-service channels then strive to make improvements wherever possible. Remember, the ROI is not just measured in reduced caseloads for your CSRs; it includes reduced customer effort, and increases customer loyalty. VoxPeritus consistently finds that nearly every company overlooks this. Where there are efforts applied, companies expend efforts in a stovepipe fashion, with no coordination between the digital and voice channels. Furthermore, it is either a one and done activity, or an occasional review, when in fact, it should be part of the fabric of the organizations’ operations. Amazon takes a ruthless approach; every single voice call is considered a failure, and the reasons behind each call are analyzed for ways to prevent the need for a voice (and I should add, email) contact in the future. Then constantly monitor these channels. Nearly every transaction I have these days has at least one technical failure somewhere in the channels. A perfect example: this week I needed to correct an airline’s merger of my two loyalty programs. I could not find any difference in data between the two accounts, nor eventually could a CSR. Yet the data merger failed. Failure #1. I logged into the new web site to merge the accounts, and the site would not recognize the account number that had the vast majority of miles. Failure #2. I phoned the loyalty toll free number, was in queue for approximately 10 minutes, and then the line dropped. I dialed back in several times but was unable to connect. I later discovered their phone system failed. They tested the systems involved; yet do not actively monitor their voice channel. Failure #3. I eventually was able to merge the accounts, but the entire process stuck another stake in the heart of our nearly dead relationship. All too often, VoxPeritus has test results supplied by companies, yet there are no follow up tests, nor ongoing monitoring. What has changed over the past twenty years is that there are now automated testing and monitoring solutions from companies like our partner Cyara, so there are absolutely no good reasons not to adopt a strategic testing and monitoring program. Yet that is exactly what has happened with the advent of the digital channel; companies relegate customer service to at best an advisor, at worst, digital teams completely owning the digital channels with little to no customer service oversight. If companies cannot tolerate the organizational change, then use a financial carrot and stick approach. 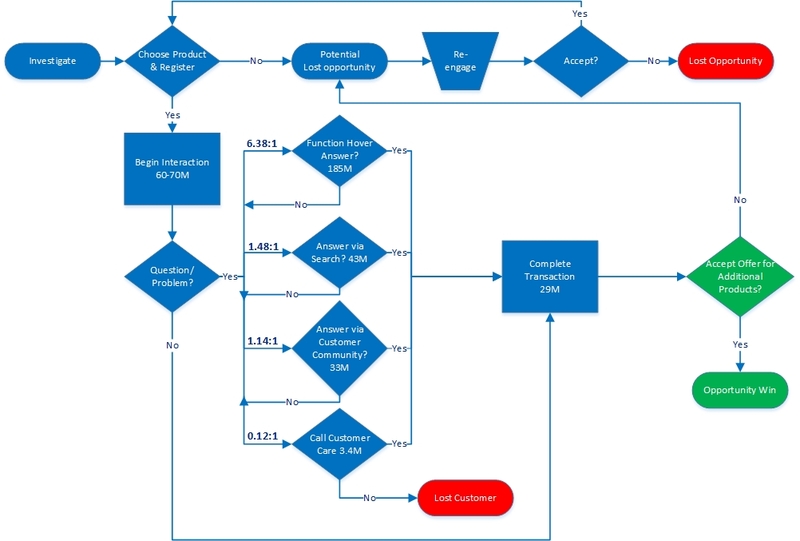 Make reduction of customer support calls a target for the digital channel. If they miss the target, it comes out of their pay and the bonuses go to the customer service teams for once again playing the safety net role. All customer preference data, regardless if it comes from voice or data vendors point to customers preferring digital self-service. Increasing call volumes in the voice channel point a strong finger at the digital channel as failing customers all too often. Again, after twenty years! In most organizations, ongoing abandonment in the voice channel would mean a change in customer service executive management. Yet because contact centers’ voice channel provides the safety net to the digital channel, those executives who own the digital channels get a free pass. There is no panacea to provide excellent customer service. It is a balancing act of relatively simple activities, coupled with good people skills. Contact centers use technologies that do not change overnight. The people who are pandering sudden change are trying to take your company’s money, and they will use whatever tactic works. Do not be one of those who fall for the bright and shiny toy sales tactic. Plenty of analysts and pundits post all over the Internet 24/7 who constantly tout your need to “change the status quo and move on to something new!” It seems to me that given their prodigious pandering, they cannot have enough time to practice customer service. In addition, a not too secret reality about the analyst community is that they receive compensation in different forms for helping sell “stuff.” Certainly some of the positions they take are consistent over time and not tied to particular firms. Nevertheless, all too often, they base their positions on buzzwords and the latest fad just to justify why you need to buy new stuff. Hence my rant here about the Millennial, Gen Y, Gen Z hoopla. Do not fall for it! Now quit reading what I have to say and get back to your business and focus on the basics. Kevin Brown began his career in sales, where he set company records for gaining new customers with American Greetings (breaking 80 years of records), Airborne Express and TNT Express Worldwide. As TNT’s Global Service Quality Director, he was involved in Customer Service, Sales and Operations improvements around the globe. His career transition to customer support technologies began at DHL in 1993, during the time that DHL’s customer service organization received awards for top contact center practices in the world from numerous organizations. This entry was posted in Uncategorized and tagged Customer experience, millennials. Bookmark the permalink.